Hard to believe the new film directed by Mike Thurmeier and Galen T. Chu with a script by Michael J. Wilson is the fifth installment of the series that started in 2002. 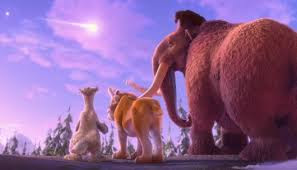 The continuing adventure of the characters of mammoths, sloths, and sabre tooth tigers that are now older and confronting getting older and their children leaving the nest, but they also face the possible annihilation of life as the know it when meteors rain down on them. Ray Romano is once again the voice of wooly mammoth Manny who is not willing to let go of his daughter Peaches (Keke Palmer) who is set to marry Julian (Adam DeVine). Mom Ellie ( Queen Latifah) tries to get Manny to accept his son in law to be and found some common ground with him. Everything is going in typical sit com fashion, but up in space Scratch the acorn obsessed squirrel had in earthed a spaceship frozen in a mountain of ice and inadvertainly launched it into space hitting debris causing a chunk of rock to plunge towards earth. Hoping to avoid the destruction Manny thinks that the should go to the underground dinosaur habitat from the last movie. Buck (Simon Pegg), the one eyed weasel and dinosaur hunter has found pillar of prophecy etched in pictures. He's discovered that the asteroids have always landed in the same place. If they find the spot they can figure out how to stop the impeding doom. But three dromarosaurs (Nick Offeman, Stephanie Breatriz, and Max Greenfield) want to stop them figuring that since the can fly they will inherit the world. Buck's plan is to use the crystals from the last event to divert the approaching space rock bye its magnetic properties. But inside one of the crystal they find Geotopia, a hippie type world where its inhabitants don't age run my the Shangri Llama (Jesse Tyler Ferguson). Most of this doesn't make a whole lot of sense. There are comic asides by Neil deBuck Weasel (Neil deGrasse Tyson) to point out the absurdity of it all. But that's the whole point of this film series that its not there to teach some environmental lesson to kids as much as telling a story of the importance of family. Its fun and mindless but the really young ones may get restless before its all said and done.